Good evening from Santa Cruz de Tenerife, or “Buenas tardes” as we say around these parts. Meeting the guys and gals who are crewing Shenandoah, we will do in more detail as the days go by, but here’s a brief overview. 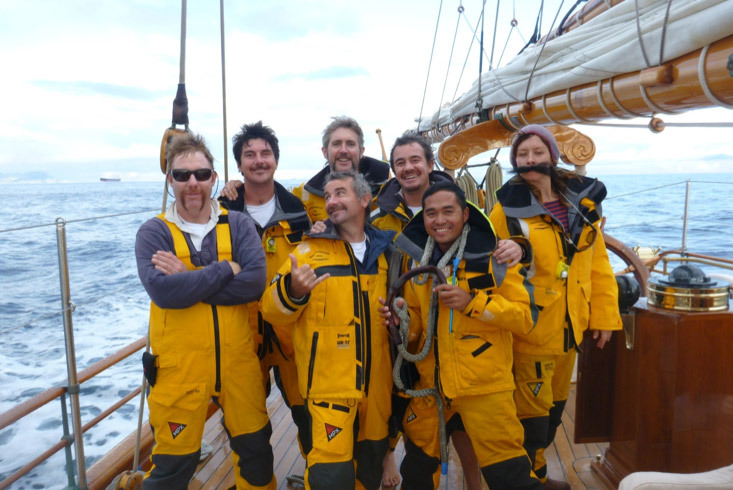 The permanent crew are a healthy mix of Europeans, antipodeans and South East Asians. Captain Russell is English as are the Bosun (Me), the Chief Stewardess Abi, the Chef Gareth M and the Chief Engineer Gareth H. From elsewhere in Europe we have the second stewardess Ieva who is Latvian. From down under is first officer Tim and our new engineer Andy, both of Aussie provenance, and deckhand Denis is from across the Tasman sea, from Greymouth on the south island of New Zealand. Last but most definitely not least are 2nd Engineer, Thanny and deckhand Bryan, both of who are from the paradise islands of the Philippines. We also have hired guns, extra crew we’ve brought in to help us sail the yacht in a race. We have four watches of four people with the Captain, First Officer and Bosun leading one each. The fourth watch leader is one of our imports, Chuck Demangeat, who is a bit of a legend and a long time veteran of many a season on the classic circuit. If you see a big silver mop of hair, moustache, sailing gilet, pair of jeans and clogs walking down the dock, it can be only Chuck. Also on the team sheet we have a couple of Aussies in the form of Jesse and Alan, Kate who is English and Gemma from the west of Scotland. To get to the night before the start gun has taken a huge effort on everyone’s part. A couple of false starts were had in Palma de Mallorca, where we failed to leave a couple of days in a row, largely due to electronics boffins who turned out to be more Buffoons than boffins. If you don’t know your port from starboard, forward from astern, and on from off, you’re probably in the wrong trade guys! Anyway, with our propeller pitches finally sorted we set off. 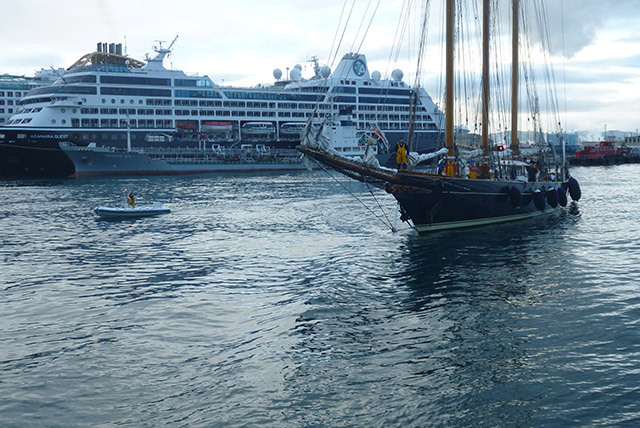 We had a fairly uneventful trip down through the Med with the exception of a fair bit of sail training, one tuna caught, and quickly eaten, and a very interesting stop in Gibraltar for fuel bunkering and a whistle-stop bit of sightseeing. The Shenandoah Crew sporting their Movember facial hair. All facial hair is genuine except for Gemma’s Marx Brothers special, and Bryan’s leather tache. L to R; Mate Tim, Jesse, Alan (front), Bosun Will (back), chef Gareth, Bryan and Gemma. Also figuring large in the preparations is facial hair. November becomes ‘Movember’ in Australia, and it’s a charity facial hair challenge which is taking over more and more of the world every year. The big Shen are fully involved with some fairly strange arrangements including super-hirsute Tim’s ginger effort, which he is lengthening with every shave, and has now almost reached his belly button. Engineer Gareth is out of punching distance of his long-suffering wife Becky and so is feeling brave. Unfortunately he’s decided to go for a thinnish, pencil looking sort of a deal, which makes him look like a cross between Craig David and Uncle Fester. That’s all for now. Will.